Of the docs I heard that morning, the “upholstery” one (Red, White and Bruised by John Musto and Brian Barnhart Jr) impressed me most: it had the right mix of serious matter and fun. I even wrote down an expression used by the main character :”I was holding the world by the tail” – in my mind I saw him as the big dog in Tom & Jerry, while the world was poor Tom, being given a spin by the tail by that furious quadruped. Good audio does that, conjuring visuals to round up the comic effect. Good storytelling does that, too. And so, that sound byte put a smile on my face while everyone else in the room gasped while hearing the number of cuts an upholsterer gets daily. 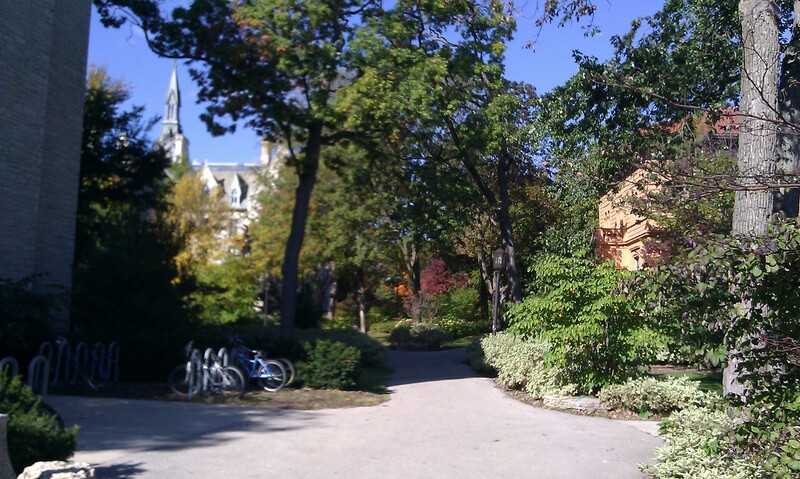 A beautiful walk followed, from the Hilton to the conference home at the beautiful Northwestern University campus. I remember thinking of the good laughs I had during Silvain Gire‘s presentation the night before, the smiles this morning hearing that upholsterer: why not expect more? There weren’t much more smiles during sessions, as presenters focused on serious matter rather than humor – as if the two exclude each other. It is probably the most common reproach I hear when I ask people why are they not listening to public radio, both in Canada and US: not funny. 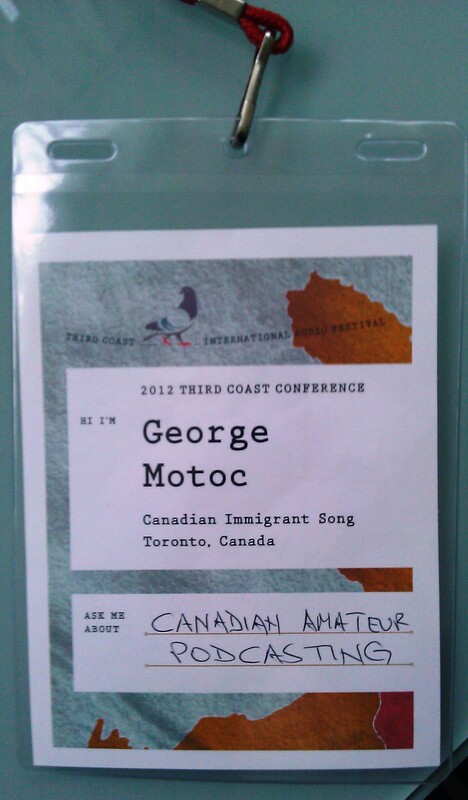 The presenters at Third Coast Conference did not change that perception – even though most of them are amusingly clever people. Public radio and audio could use a tip or two from stand up comedy. This catchy title was irresistible – so I went to see this presentation first. AuRa establishes the new divide between Audio and Radio (hence the AuRa in the title) – a divide that did not exist a couple of generations ago, a divide facilitated by technology being largely available, among others. Nobody did radio or audio at home before the invention of mp3 – and this presentation exquisitely explores the theme. AuRa can be Audio vs Radio, or the metaphor of Au (gold) and Ra (radium) used by the author. I hope Paolo tours extensively with his presentation – I loved that he brought at the forefront classical music (being myself classically trained; check Paolo’s brilliant signature series on his site, like this one) and Canadian audio personalities. Good job! 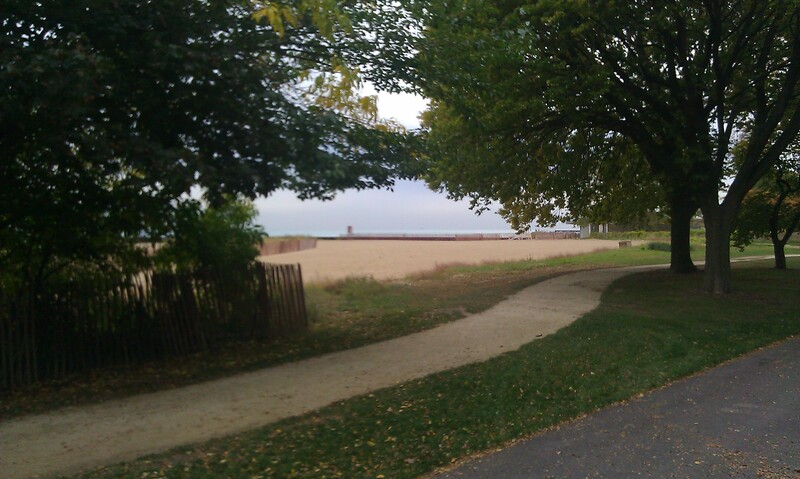 The beach by the Northwestern University campus. While preparing for the conference, I visited Krissy’s Storieseverywhere.org project – and that inspired me to create my first audio map and plan for many more. I am interested to explore the location-based-storytelling concept further more, and this presentation promised to help. For his part, Pejk featured a Manhattan-based project narrated by a very talented voiceover artist by the name of…Jim Jarmusch. It was cool to listen to the voice behind one of my all-time favorite movies, Night On Earth. One of the “notes for self” taken during the presentation (an advice I may possibly extend to you, the reader): go home and re-listen to all your audio archive, AND take notes where a location becomes a character –> then create an audio map or start a project like Krissy’s or Pejk’s. Krissy used an outdoor festival to secure a captive audience for one of her “adventures in narrative archeology and location-based storytelling” – the witty way she calls the location-based audio projects. 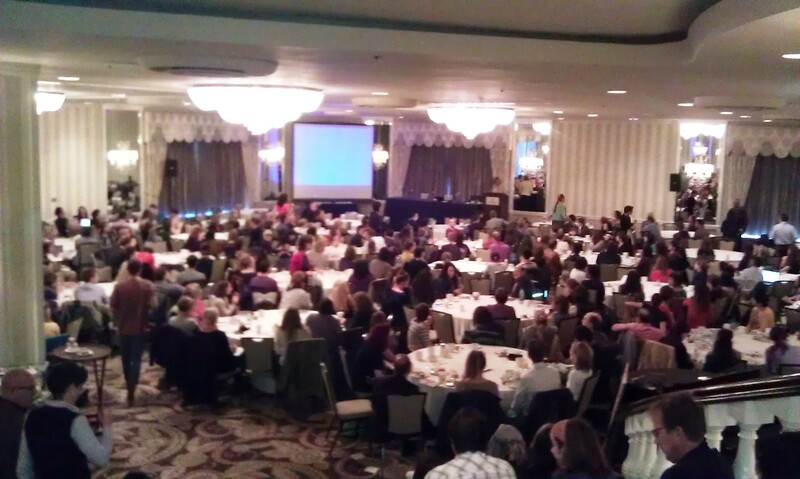 This was the Third Coast Conference’s version of the Dragon’s Den (a show I attended and exited relatively bruise-less) – minus the grilling. As opposed to Dragon’s Den, incredibly valuable advice was offered by the panel during this presentation. Canadians stick close to each other when away from home. I met a few wonderful people from CBC radio Ottawa and Montreal.